Among the most documented disasters in U.S. history was Hurricane Katrina. However, the legal ramifications of that terrible, historic storm have been relatively less acknowledged. This has changed as more and more Katrina-related decisions are handed down. Citadel Builders v. Transcontinental Realty is one such case, which addresses a contract termination dispute. Transcontinental Realty Investors signed a contract on Aug. 15, 2005 with Citadel Builders for construction of a $7.2 million parking garage in downtown New Orleans. Then, on Aug. 29, 2005, Hurricane Katrina struck. On Nov. 7, 2005, Transcontinental canceled the parking garage contract, observing that logistical problems and cost increases caused by the storm’s aftermath made completion impractical. At the time of termination, there had been no work performed on the site, and Citadel had spent only $16,549.40 to hire two supervisory personnel for the project. Citadel sued Transcontinental for $366,549.40, claiming that the contract was terminated “for convenience” and Citadel was entitled not only to the $16,549.40 it had actually spent, but also to its anticipated profit ($350,000) on project completion. A motion was filed by Citadel for summary judgment. They argued that hurricanes in New Orleans are foreseeable events, and that Katrina didn’t make construction of the parking garage impossible, as Transcontinental asserted. The U.S. District Court for the Eastern District of Louisiana ruled against Citadel. It cited the unprecedented extent of storm damage and flooding in New Orleans after Katrina as compared with other hurricanes that had struck there. It held that the construction company wasn’t entitled to the lost profits sought in the summary judgment motion, unless Citadel could prove it was prepared to complete the project without any price increase above the amount agreed on before the storm. But Citadel cannot prevail unless it stood ready to honor its own obligations under the contract including completing the project at the pre-Katrina agreed upon price notwithstanding the post-Katrina increases in materials, labor and housing. The court observed that, even two years after Katrina, the New Orleans area hadn’t returned to anywhere near the state of normalcy present before the storm, which drew a distinction between its opinion and earlier ones ruling that hurricanes in New Orleans are foreseeable. Therefore, the court couldn’t decide, as a matter of law, that the parties to the contract could have foreseen Katrina’s aftermath. The opinion goes on to point out that, under Louisiana law, even partial impossibility of performance could allow the court to void the contract, leaving Citadel entitled to only the $16,549.40 in costs actually incurred before the storm. Basically, it was concluded by the court in this case after looking at all the circumstances that Transcontinental was doing Citadel a favor by letting the construction company out of the contract. In turn, the court indicated that Citadel, in seeking additional recovery of the profits it might have received if not for Hurricane Katrina, was attempting to take advantage of Transcontinental’s generosity. The court also concluded that Citadel could well have lost money rather than profited, once the project was completed, if Transcontinental held Citadel’s feet to the fire. The court decided that, before Citadel could recover lost profits, the construction company would have to prove both that the parking garage project could have reasonably been completed after Katrina, and that Citadel could have made the profit it sought even at the pre-Katrina contract price. 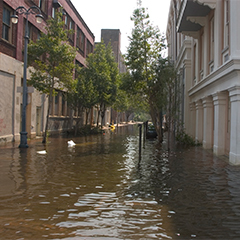 Hurricanes may not be uncommon in New Orleans and other coastal areas, but the Katrina disaster was unprecedented in scope for its time. As the outcome of this case shows, extraordinary circumstances can affect a court’s decision regarding the termination of a construction contract.